I can definitely agreed with that. I think the Simon Cowell head should have been omitted in favor of a smiling head. just wanted to mention and give credit to Neca for their design on the Pennywise balloons, these are awesome accessories. nobody has mentioned them. Okay, now they're REALLY starting to milk this. These new heads are awesome. I just preordered 4. Yeah they gotta stop putting Ultimate on everything. The first It was a deluxe release I guess b/c of the extra heads, but no where near Ultimate since this is the second release with additional accessories the first "Ultimate" didn't get. There's also, I believe, 1 more 2017 Pennywise still. There was a different head sculpt shown via their Twitter avatar, which had blue eyes. 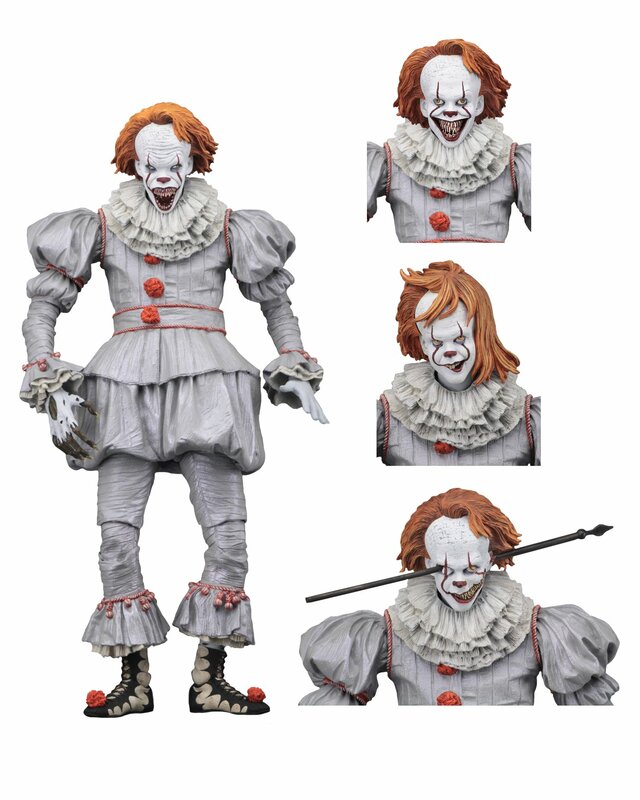 I like this a lot and while I give credit to NECA for finally giving us a Pennywise that is the closest to being an actual “ultimate” figure I can’t help, but mention that this very easily could have been achieved by releasing an IT 2017 Accessory set. But I guess at this point we should all just expect and accept that every new figure release is just going to have “Ultimate” slapped on the title whether it’s deserving or not. Next up Ultimate blue-eyed Sewer Pennywise with exclusive wet hair headsculpt, brand new semi gripping hands and a missing Georgie poster on card stock... I kid, but in all seriousness that’s what these releases feel like at this point. 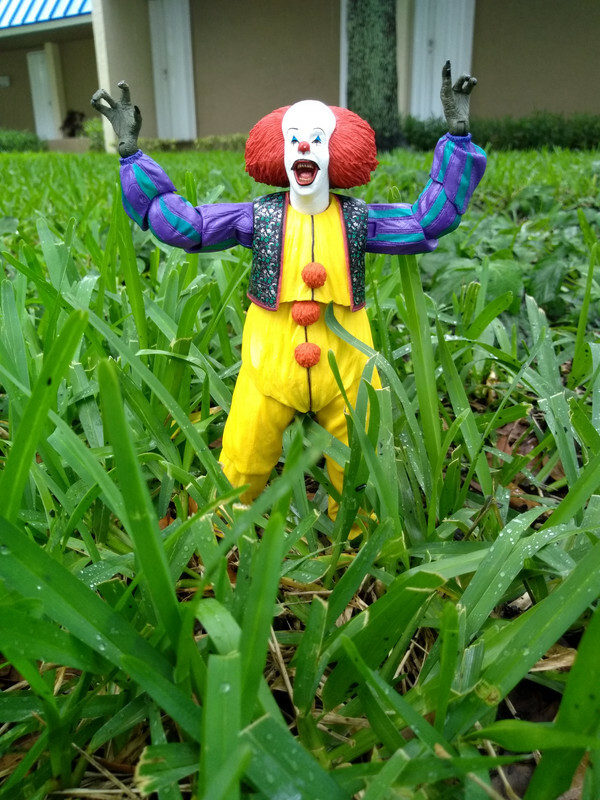 Last edited by AlanThCollector; 10-25-2018 at 09:41 AM..
Just bought my Classic and Neo Pennywise figures at the Weekend of Fear. I like the new head sculpts, but have no reason to buy a second, identical, body to get them (especially since I prefer the first set of heads for display). I was actually more referring to ANOTHER Pennywise figure using this same base body (this is the third, and Joe said at least one more is likely coming) than I was about NECA's use of the "Ultimate" branding. With 4 heads I think this qualifies as an Ultimate, whereas the recent Ultimate Fugitive Predator doesn't. I can't argue with actions like this. After all, I bought 4 of the Part 5 Dream Jasons due to all the awesome heads. Last edited by Dolemite; 10-25-2018 at 02:56 PM..
Their older Ultimates did that, they did an Ultimate Gypsy Danger that had all the accessories of previous releases put together. Glad I waited! Ima definitely pick this up. Actually their Ultimate Gypsy Danger didn’t include the boat weapon accessory from the Original 2.0 release, the cargo container accessories for the open hands or the elbow rocked fire effect that came with the Battle at the Docks version. A lot of their Ultimate figures questionably leave important accessories out. Their Ultimate Nightmare on Elm Street Part 1 Freddy didn’t even include the swap out elongated arm accessories on the initial Ultimate release or the re-release that the original figure had years ago. Last edited by AlanThCollector; 10-25-2018 at 01:25 PM..
wait a second, are they doing this with the classic penny? not interested in this one. There's been no hints or anything regarding another Curry Pennywise that I know of, but I definitely wouldn't rule it out. That head on the full-body picture looks eerily like Benebatch Cumberbund or whatever his name is. This is an absolute misfire of an accessory pack. 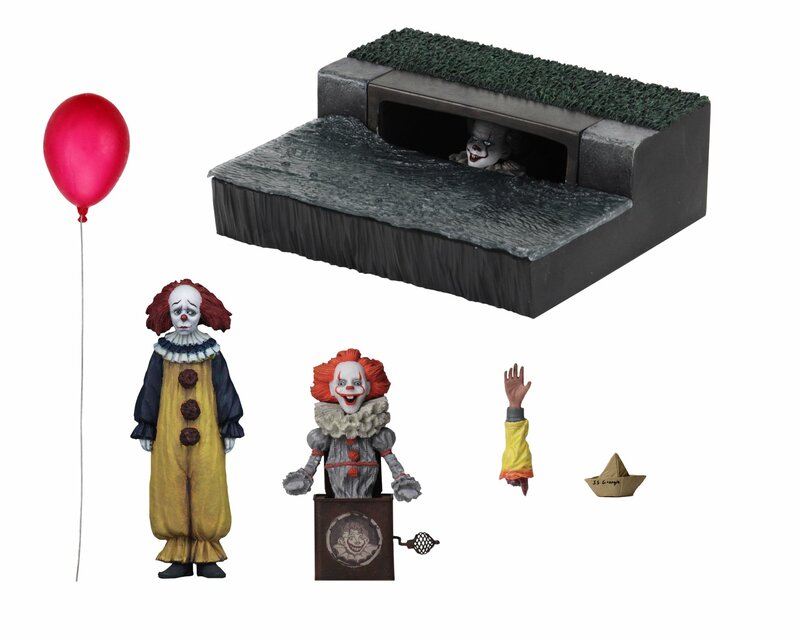 Two accessories we already have, one reused exclusive accessory that dilutes the appeal of the Gamestop version, two Pennywise dolls that were background pieces that hardly anyone noticed and a sewer grate? (admittedly don't hate the sewer piece BUT it'd be better if you could swap the heads out in there and if it could attach in some way to the upcoming street diorama). Better idea for an accessory pack: the heads Pennywise went through in the final fight scene, a smoking egg, a slide projector, swappable insect arms (I know Randy has said the arms weren't made to be swapped out but c'mon!) and some papergoods missing children posters. Boom, you're welcome NECA. Yeah I agree. Also to rehash from earlier discussion, I really don't like that they called the figure Ultimate when it clearly wasn't. There's 3 releases and now an accessory pack. Just remove the Ultimate from the title and it won't annoy people. They're just normal releases or call it a deluxe if you must, but it's not ultimate when you've got all this that could have been cobbled together in 1 ULTIMATE release. Could they be working up to a Georgie figure? The drain will look rather empty without him.